Summary. Aim: To evaluate the presence of the aggregated proteins in malignant and benign neoplasms for clarifying the role of impaired protein metabolism in the formation of the altered tissues. Object and Methods: The histological specimens prepared from the operative materials of 196 patients with different forms of malignant and benign neoplasms were stained with Congo red and Thioflavin T and studied under the light and polarization microscope. Results: The various forms of β-stacked protein aggregates (β-SPA) inclusions were detected in amyloids, keloid tissue, benign polyps, and several malignant tumors. Conclusion: The formation of non-functional protein aggregates proves the complex character of the impairment of protein metabolism resulting in local or systemic accumulation of secondary protein toxins results in β-SPA formation as the self-sustaining complex of parametabolic processes. The β-SPA formation is of considerable interest since their properties lead to the impairment of the normal physiological processes in adjacent tissues ensuring the chronic course of the pathology. Abbreviation used: β-SPA — β-stacked protein aggregates. The metabolism is mediated by the wide set of enzymatic and non-enzymatic reactions, which are in the complex relationships to each other. An essential feature of non-enzymatic reactions is their autochthonous cha­racter caused by the high energy advantages of the molecular transformations. Normally, the products of such parametabolic processes are in harmony with various systems in the body, but if such harmony is disturbed, they become the secondary toxicants. Excessive amounts of such abnormal metabolites are able to impair dramatically vitally important processes. The potent oxidizing agents and carbonyl compounds mediate parame­tabolic reactions. Both reactants are generated during normal metabolism, while their surplus induces severe molecular dysfunctions. Endless list of reactive oxygen species contains O2-, hydrogen peroxide, hydroxyl radical HO•, nitric oxide NO, hypochloride, singlet oxygen 1O2, peroxynitrite anion ONOO– and numerous peroxyl radicals . Excessive reactive oxygen species generation is associated with various pathologies damaging nucleic acids, proteins and lipids . The resulting derivates are not only functionally defective, but also affect adversely a variety of processes in avalanche-like character. Another example of non-enzymatic reactions is the glycation caused by the conjugation of proteins with carbonyl-containing compounds. This is a non-enzymatic multistep process of interaction between lysine, arginine and, to lesser extent, cysteine residues located on the surface of the protein globule with the aldehyde group of D-glucose acyclic form. The elevated level of protein glycation is directly associated with diabetes and its complications, such as cardiovascular diseases, nephropathies and impairments of vision . Besides glucose, a plenty of more reactive carbonyl group-containing compounds (methylglyoxal, glyoxal, 3-deoxyglucosone, and various products of unsaturated fatty acid oxidation) are capable of effectively interacting with proteins . Protein glycation leads to impairments of the native structure and thus facilitates exposure of a protein molecule due to interaction with carbonyl-containing reactants . Further transformation of the glycated protein and its ability to association with other protein molecules result in the formation of so-called advanced glycation end-products demonstrating immunogenicity, toxicity and capability to disturb a variety of physiological processes . It is worth noting that glycation-induced structural reorganization of proteins results in the formation of β-stacked protein aggregates (β-SPA) [6–8]. The native formation of the structure of most proteins referred as “a native protein folding” is a complex, multistep and energy-consuming process mediated by the complex of specific proteins known as the chaperones. The chaperons actively interact with non-structured and denatured proteins; however they are inert in relation to the proper proteins in native conformation [9, 10]. This process proceeds according to the principles of the free energy minimum corresponding to the structural demands of the given biological system. However, in the setting up the massive damage of protein structure, another form of structure forming becomes actual mediated by the interaction with cell membranes and called as a membrane folding. The formation of proteins and peptides with unba­lanced structure is an inalienable feature of a wide variety of diseases. Being some kind of the secondary toxicants, such proteins are able to impair significantly various physio­logical processes as well as the structure and functioning of tissues. The consequences of such secondary effects often may exceed the underlying cause of the disease. A number of investigations focused on the interaction between non-structured proteins or peptides and native or artificial membrane structures. The results of these studies indicate regularity of this process, which differs from spontaneous protein self-assembly demonstrated by Anfinsen as well as native folding mediated by chaperons . The multistep character of this process has been demonstrated. It includes initial binding of polypeptide chain with membrane surface, its folding in α-spiral, and incorporation of the latter into the hydrophobic membrane bilayer [12–14]. The further formation of the tertiary structure is mediated by interaction of separate fragments of the polypeptide chain both between each other and phospholipid bilayer of a membrane, resulting in transition of a large or small part of the polypeptide chain from α-helix to β-sheet conformation  as a highly stabilized structure. It is sufficiently distinct from the native form of corresponding protein possessing some properties underlying various dysfunctions both on molecular and cellular levels. The increased surface hydrophobicity of the intra-membrane part of the protein structured by membrane folding contributes to its ability to incorporate into cellular membranes. In contrast, the positively charged amino acid residues of protein domains located outside the membrane are often exposed inward the cytosol by the “positive-inside” rule , while mutually compensated positively and negatively charged residues are oriented basically into the extracellular environment . Exposure of the non-compensated positively charged amino acid residues on the intracellular side of a membrane provides almost ideal conditions for their interaction with carbonyl compounds. On the other hand, the exposure of fixed dipole pairs on the cellular surface induces a cascade of functionally invalid proteolytic and activating reactions . In this case, one can confidently speak of non-enzymatic formation of the false sites of inter-protein recognition. The special attention should be paid to the consequences of intramembrane transformations of the protein structures leading to β-SPA formation. Such structures are able to absorb soluble proteins with further induction of their conformational rearrangement by the “α-helix — β-structure” type, resulting in the formation of the new β-SPA layers [19, 20]. Due to energetic advantages of this process, it is realized in a spontaneous non-enzymatic way, keeping within the self-assembly principle of Anfinsen. The most dramatic manifestation of the parametabolic β-structuring of proteins is the amyloidosis, in which normal soluble protein, with or without proteolytic cleavage, forms the insoluble amyloidal fibrils . Despite a great variety of amyloidal diseases, β-SPA deposits are their shared feature. It is known that β-structured protein aggregates are a kind of “energy bottom” for an immense number of conformational states of protein molecules . It is important to note that parts of the molecule reorganized into the β-sheet structures become highly stable towards the proteases, which are able to cleave off effectively the intact parts of the molecule . The disruption of the native protein structure is an important factor, leading to β-aggregation . The role of such processes in the formation of various abnormal tissues deserves peculiar attention. Such processes are observed both for pathological changes, and for the normal state of many living organisms . The relationship between similar parametabolic reactions is considered in detail on the example of biofilms’ formation . The starting matrix of the aggregative process may be formed by the damaged structures of insoluble proteins, by membrane folding of the soluble ones or by spontaneous β-aggregation from the solution . The restriction of this complex of parametabolic processes is determined by the ability or inability of the body’s defense systems to quench the corresponding reactions by blocking or removing the corresponding reagents. The problem is complicated by insolubility, resistance for proteolysis, and immunogenicity of β-SPA. Since β-SPA seem to be the consequence of the altered metabolism leading to the generation of the structurally damaged proteins it is of interest to check different pathologically altered tissues for the presence of β-SPA structures. Therefore, the aim of our study was to verify the possible presence of β-SPA in malignant and benign neoplasms. To accomplish this task, it was considered appropriate to use the dyes specifics for β-folded structures Congo red and Thioflavin T that are characterized by exceptionally high affinity to amyloid inclusions precisely and that are neutral for healthy tissues [28, 29]. Common usage of these dyes at light, polarization and luminescent microscopy is universally considered for proof of amyloid-like nature of inclusions or, more precisely, for conjunctions of β-structured aggregates in their composition [21, 30]. The samples of the operative materials representing the different forms of abnormal tissues were analyzed. The tissues were fixed in 10% neutral formalin, dehydrated in ethyl alcohol of ascending concentrations (from 50% to 96%) and embedded into paraffin blocks with following preparation of 5 μm slices. The slices were stained by standard methods with hematoxylin and eosin, van Gieson’s picro fuchsin, and Congo red by Puhtler [31, 32]. Light and polarized microscopic studies microscopes were carried out with OLYMPUS BX43 and BX53. Specific dyes of Congo red and Thiopfavin T (Acros Organics, USA) were used in the form of a 0.1% solution in 0.9% sodium chloride. The operative material that was obtained during the surgical procedures in patients with amyloidosis of the oropharynx was used as internal control to assess the informativeness of the methods used. As expected, the tissues stained with Congo red turned out to be brick-red when viewed in a light microscope and apple-green in a polarizing one (Fig. 1). Meanwhile, the amyloidosis may not be considered as the only and, apparently, even the most common manifestation of the of β-SPA in the living organism. The keloids that can be formed at the site of any, even minor, trauma, represent another example. There is no unanimous opinion regarding the nature of the keloids. Some authors consider them as a proliferation of fibrous tissue that emanates from the papillary layer of the scar and develops as a result of the injury, others — as a variety of scarring changes in the skin, and the third ones — as a benign tumor. At the same time, the formation of keloids due to processes, somehow associated with protein metabolism disturbance, their high stability, ability to grow and regenerate allow to suspect the presence of β-SPA. Indeed, when viewed in a light microscope of Congo red-colored preparations of keloid of the earlobe the characteristic brick-red inclusions are observed. The same inclusions in polari­zed microscope are painted in shades of green (Fig. 2). The presence of β-SPA in keloids allows us to explain such properties of this abnormal tissue as the ability to grow and regenerate as the result of the altered protein metabolism with the following involvement of non-enzymatic processes noted above. No less interest is caused by vascular polyps — sprouting outgrowths on the mucosa of the diverse localization. Despite many years of research, the etiology of polyposis has no proven and universally accepted explanation. As the most probable reason for their appearance, the local inflammatory processes are supposed. As long as these processes are connected with the impaired protein metabolism [33, 34], since it led us to test the presence of β-SPA in nasal polyps by the classical method with Congo red stain and usage of the light and polarization microscopy. One can see that the tissues considered became painted typical for amyloids Congo red pink-red color in light microscopy and into golden-green in the polarizing one (Fig. 3). 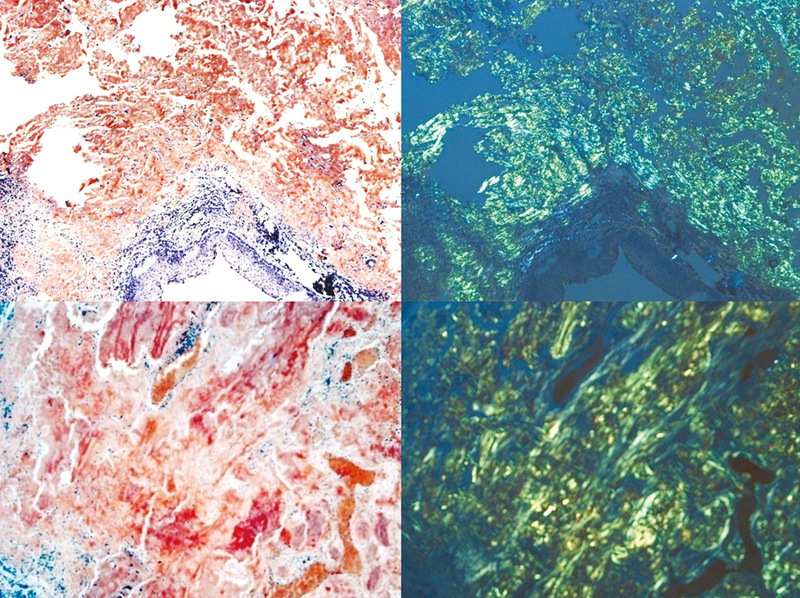 Such color effects may be evaluated as the direct evidence of the presence of β-SPA in the tissues under consideration. It should be noted that for all the advantages of Congo red dye at combined use of the light and polarization microscopy, the Abbe diffraction limitation (0.61 λ) excludes the observation of objects smaller than 240 nm. That’s why the use of another amyloid-specific dye — Thioflavine T — seems to be more informative. Indeed, an abundant scattering of small diffuse β-SPA inclusions were observed (Fig. 4). The presence of such inclusions in the polyp-surrounded tissues may be the reason for the high postoperative relapse of the polyposis. The reasons for the interest to in the participation of the considered complex of non-enzymatic processes in the formation of various neoplasms are obvious. The formation and development of these tissues are associated with a disturbance of proteinase-inhibitory balance, oxidative stress and non-functional associative processes leading to the accumulation of significant amounts of secon­dary intoxicants . 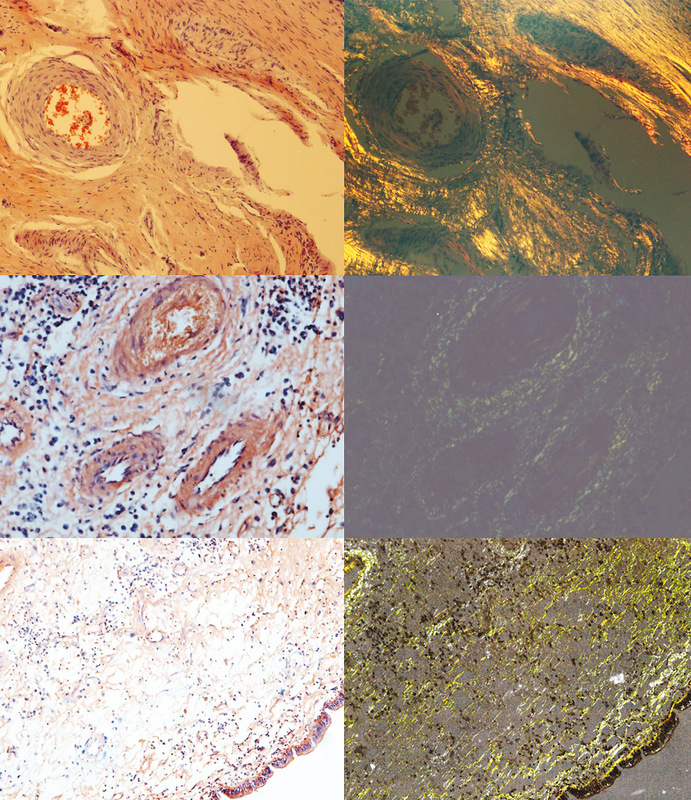 At the microscopic examination by light and polarization microscopy of the histostructures of the Congo-colored colored neoplasms, the characteristic signs for β-SPA were revealed. They were detected in the dead cells, where so-called “pearls” of keratin masses of squamous cell carcinoma were formed (Fig. 5). There is a fragmentary staining of the cornea’s “pearls” of Congo red in a light microscope and their bright yellow glow in the polarization. Such effects are particularly characteristic of the bundles of collagen fibers of the connective tissue that delineate the mass of cancer cells (Fig. 6). In this case, cancer cells themselves are not stained in red and do not show optical anisotropy (upper right segments of Fig. 4). At the staining of these tissues by van Gieson fuchsin picrate, the typical for collagen fibers pink-red coloration is observed. The formation of keratin masses in the normal squamous epithelium with hyperkeratosis is also accompanied by a gradual increase in optical anisotropy, which may indicate changes in the molecular structure of the epithelium. The most common forms of tumors of the upper respiratory tract of the neurogenic origin include neurinomas, neurofibromas and esthesioneuroblastomas. The parenchymal components of these tumors do not show the optical activity observed in the colored connective cords that restrict the mass of cancer cells (Fig. 7, 8). A very similar pattern is observed in melanoma, a tumor of neuroectodermal origin. Like cancer cells, melanoma cells, when staining the Congo, do not exhibit optical activity and remain shaded against the golden glow of connective tissue fibers (Fig. 9). It is indicative that the blood vessels of the arterioles of the muscular type are optically active only the outer side of the vessel. A similar pattern is observed in the vessels of capillary and sinusoidal types with hemangiomas (Fig. 8). As is known, the walls of these vessels are formed by thin reticular (pre-collagen) fibers. As follows from the figures given above, polarization microscopy is a necessary complement to light microscopy, making more discernable the structure of the tissues under study and preventing false interpretation of the images. Similarly to the case of local amyloidosis (Fig. 1), which do not have optical activity, dark red blood cells appear to be shadowed and qualitatively different from those that are glowing brightly in the polarization microscope of the walls of the vessels (Fig. 10). It is worth emphasizing that the specificity of staining Congo’s tissues with red as a criterion of amyloidosis was at one time questioned precisely because of the staining of the tissues of keloids, polyps and malignant tumors [28, 36]. The same doubts were raised when Thioflavin T was used [29, 37]. However, it should be noted that the nature of amyloids as a type of β-SPA deposition was established in 1968 only, when the concept of non-enzymatic reactions was in its infancy, and understanding of the complex nature of their effects on the tissues abnormalities was formulated quite recently . In other words, the fate of abnormal tissues is determined by the ability or inability of the body’s defense systems to limit the effects of this universal, omnipresent and autochthonous complex of the processes under consideration. To sum up, the results of our research indicate the complex character of non-enzymatic reactions in normal and pathological tissues. The relationship between the reactions of this complex and the formation of a positive feedback between them is shown. Any impairment of protein metabolism at the lack of effective protective systems leads to local or systemic accumulation of secondary protein toxins, which under certain conditions form β-SPA. The consequences of such secondary effects may outweigh the underlying disease. The structural properties of such inclusions contribute to the disruption of normal physiological processes in the adjacent tissues, ensure the chronic course of the process and its recurrence. The formation of β-SPA can be quite a common consequence of impaired protein metabolism. These consequences are of particular importance at cancer. In view of the high resistance of β-SPA to the effects of the protective mechanisms of the organism, the most important function of the latter is the ability to limit and localize the complex of parametabolic processes examined. Halliwell B, Gutteridge MC. Free Radicals in Biology and Medicine, Oxford: University Press, 2007. 851 p.
Vlassara H, Bucala R, Striker L. Pathogenic effects of advanced glycosylation: biochemical, biologic, and clinical implications for diabetes and aging. Lab Invest 1994; 70: 138–51. Vicente Miranda H, Outeiro T. The sour side of neurodegenerative disorders: the effect of protein glycation. J Pathol 2010; 221: 13–25. Ahmed N, Thornalley P. Advanced glycation end products: what is their relevance to difbetic complications? Diabetes Obes Metab 2007; 9: 233–45. Luthra M, Balasubramanian D. Nonenzymatic glycation alters protein structure and stability. A study of two eye lens crystallins. J Biol Chem 1993; 268: 18119–27. Bouma B, Kroon-Batenburg L, Wu YP, et al. Glycation induces formation of amyloid cross-beta structure in albumin. J Biol Chem 2003; 278: 41810–9. Bucciantini М, Giannoni Е, Chiti F, et al. Inherent toxicity of aggregates implies a common mechanism for protein misfolding diseases. Nature 2002; 416: 507–11. Demchenko A. Protein folding and molecular chaperones: stochastic process under control. Biophysics 2000; 45: 404–10. Fenton W, Horwich A. Chaperonin-mediated protein folding: fate of substrate polypeptide. Quart Rev Biophys 2003; 36: 229–56. Popot J, Saraste M. Engineering membrane proteins. Curr Opin Biotechnol 1995; 6: 394–402. Bechinger B. Understanding peptide interactions with the lipid bilayer: a guide to membrane protein engineering. Curr Opin Chem Biol 2000; 4: 639–44. Bartels T, Ahlstrom L, Leftin A, et al. The N-terminus of the intrinsically disordered protein α-synuclein triggers membrane binding and helix folding. Biophys J 2010; 99: 2116–24. Wahba K, Schwab D, Brunisma R. Statistical mechanics of integral membrane protein assembly. Biophys J 2010; 99: 2217–24. Lee C, Sun Y, Huang H. Membrane-mediated peptide conformation change from α-monomers to β-aggregates. Biophys J 2010; 98: 2236–45. Von Heijne G. Membrane protein structure prediction. Hydrophobicity analysis and the positive-inside rule. J Mol Biol 1992; 225: 487–92. Bogdanov M, Xie J, Dowhan W. Lipid-protein interactions drive membrane protein topogenesis in accordance with positive inside rule. J Biol Chem 2009; 284: 9637–41. Verevka SV, Grinenko TV. Pseudo-functional interactions of plasminogen: molecular mechanisms and pathologic appearance. In: Advances in Medicine and Biology. LV Berhardt, ed. NY: Nova Science Publishers, 2011; 34: 35–62. Koga T, Taguchi K, Kogiso M, et al. Amyloid formation of native folded protein induced by peptide-based graft copolymer. FEBS Lett 2002; 531: 137–40. Krebs M, Wilkins D, Chung E, et al. Formation and seeding of amyloid fibrils from wild-type hen lysocyme and a peptide fragment from the beta-domain. J Mol Biol 2000; 300: 541–9. Sideras K, Gertz M. Amyloidosis. Adv Clin Chem 2009; 47: 1–44. Jahn T, Radford S. The Yin and Yang of protein folding. FEBS J 2005; 272: 5962–70. Husby G, Marhaug G, Dowton B, et al. Serum amyloid A (SAA): biochemistry, genetics and the pathogenesis of AA amyloidosis. Amyloid 1994; 1: 119–37. Kelly JW. Alternative conformations of amyloidogenuc proteins governs their behavior. Curr Opin Struct Biol 1996; 6: 11–17. Zabolotnyi DI, Belousova AA, Zaritskaya IS, Verevka SV. Autochthonic β-aggregation of proteins: cause, molecular mechanisms, and pathologic consequences. Zhurn NAMN Ukrainy 2014; 24: 385–92 (in Ukrainian). Verevka S, Voroshylova N. Tumors and biofilms: too much coincidences to be casual. Biopol Cell 2018; 34: 72–81. Krebs M, Bromley E, Rogers S, Donald A. The mechanism of amyloid spherolite formation by bovine insulin. Biophys J 2005; 88: 2013–21. Brigger D, Muckle T. Comparison of Sirius red and Congo red as stains for amyloid in animal tissues. J Histochem Cytochem 1975; 23: 84–8. Saeed SM, Fine G. Thioflavin-T for amyloid detection. Am J Chem Pathol 1967; 47: 588–93. Buxbaum J, Linke R. A molecular history of the amyloidosis. J Mol Biol 2012; 421: 142–59. Merkulov GA. Course of pathohystologic techniques. Leningrad: Medicina, 1969. 424 p. (in Russian). Puchtler H, Sweat F, Levine M. On the binding of Congo red by amyloid. J Histochem Cytochem 1962; 10: 355–64. Chin D, Harvey R. Nasal polyps: an inflammatory condition requiring effective anti-inflammatory treatment. Curr Opin Otolaryngol Head Neck Surg 2013; 21: 23–30. Claus L, Van Zele T, Derycke L, et al. Local inflammation in chronic upper airway disease. Curr Pharm Des 2012; 18: 2336–46. Mason S, Joyce J. Proteolytic networks in cancer. Trends Cell Biol 2011; 21: 118–36. Klatskin G. Non-specific green birefringence in Congo red stained tissues. Am J Pathol 1969; 56: 1–13. Hodds J, Morgan A. Fluorescence microscopy with thioflavin-T in the diagnostics of amyloid. J Pathol Bacterial 1963; 86: 437–42.